Preheat oven to 450°F. 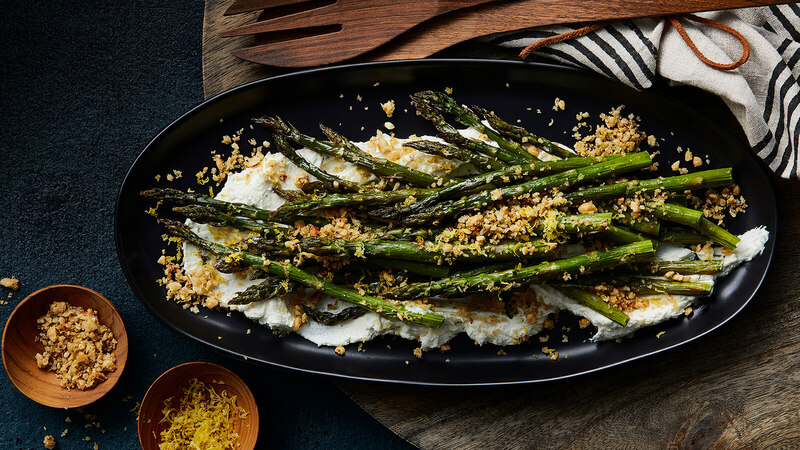 On a large rimmed sheet pan, toss asparagus with 2 tbsp olive oil to coat. Season to taste with salt and pepper. Spread asparagus in single layer. Roast, turning halfway through cooking, until tender and lightly browned, 12-15 minutes. Do not overcook. Asparagus should maintain a slightly crisp texture. Meanwhile, combine hazelnuts, panko, lemon zest and additional 1 tbsp olive oil in a small pan over medium heat. Toast until fragrant and lightly browned, about 3 minutes. Set aside. Whisk together goat cheese and buttermilk until smooth and mousse-like. Spread the goat cheese out in a layer about ¼-inch deep on a serving platter. Layer over warm asparagus and top with hazelnut mixture. Serve immediately.